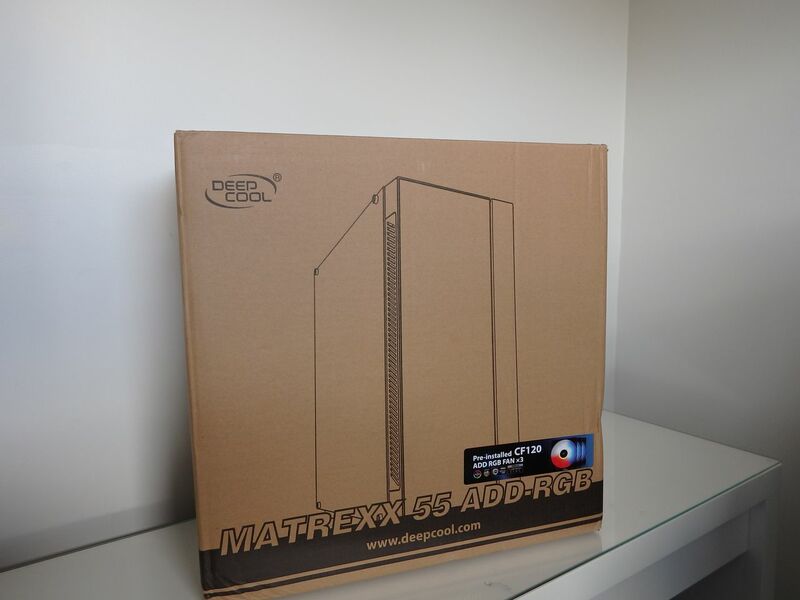 The MATREXX 55 is Deepcool’s latest budget case. The version we’re testing is the MATREXX 55 ADD-RGB 3F – Essentially it’s the top of the range ‘budget’ case in this series with 3 pre-fitted RGB fans. 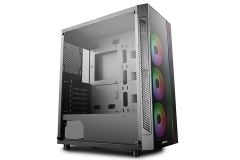 This case is for people that still want a clean look, adequate airflow, some bells and whistles but would rather spend more on the performance components. 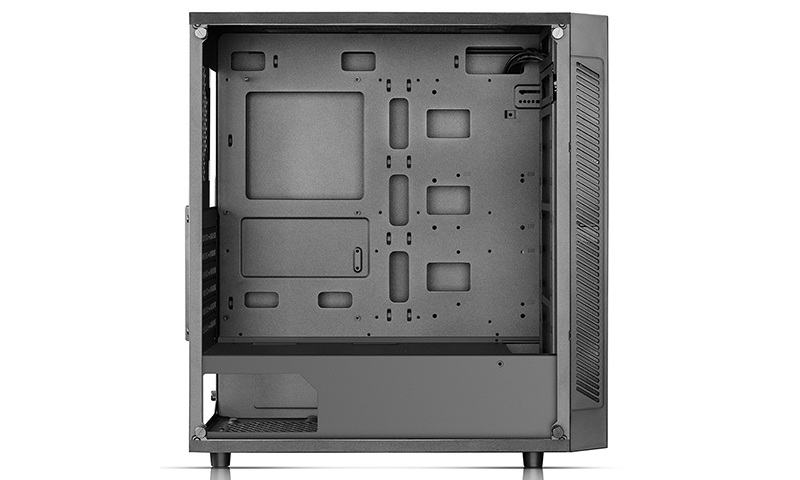 The MATREXX 55 is an ATX case that will support up to an E-ATX motherboard due to its open main chamber. 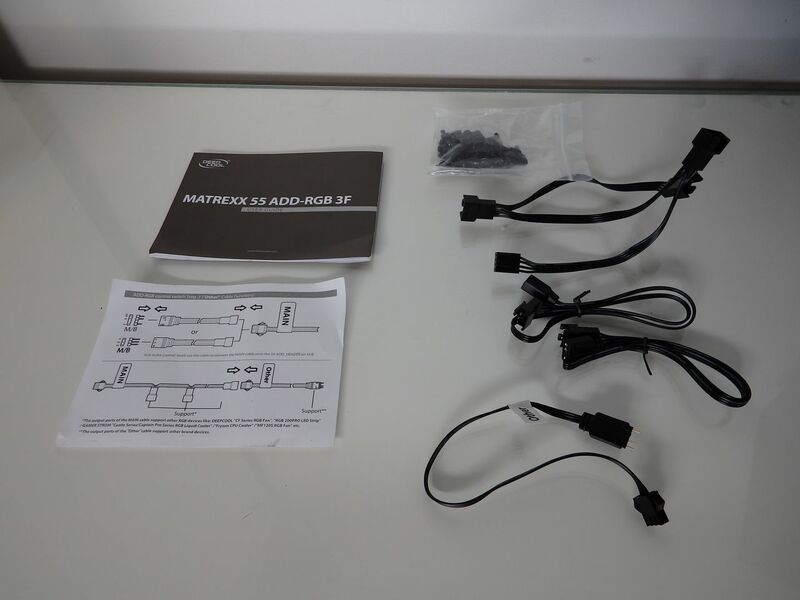 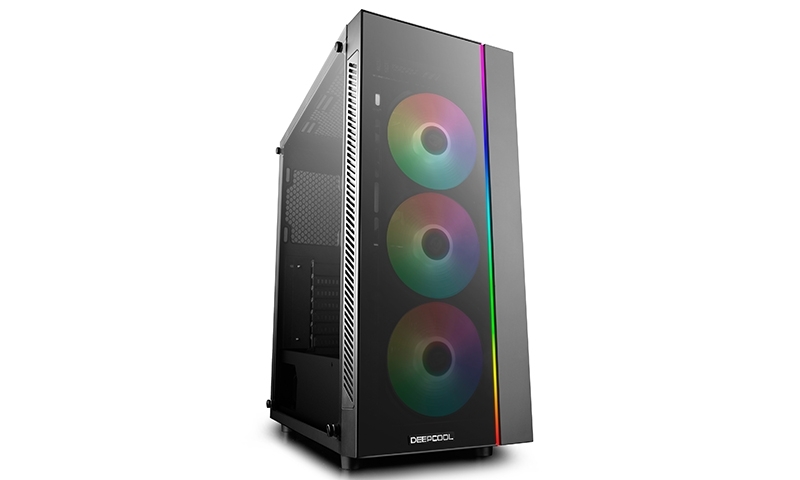 The “ADD-RGB 3F” version being reviewed also includes an addressable RGB strip and 3 RGB 120mm fans. 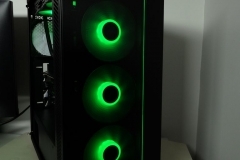 The RGB LED lighting can be controlled by either a button on the front of the case or the RGB header on modern motherboards. Aesthetically, the MATREXX55 also has a frameless 4mm-thick tempered tinted glass side panel. 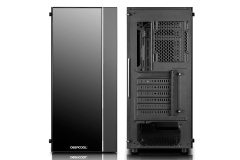 Cooling support includes 120/140/240/180/360mm radiator support with a rear 120mm fan mount. 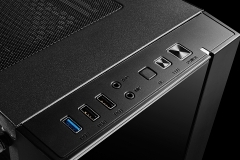 Graphics card support is also generous with an allowance of up to 370mm in length. 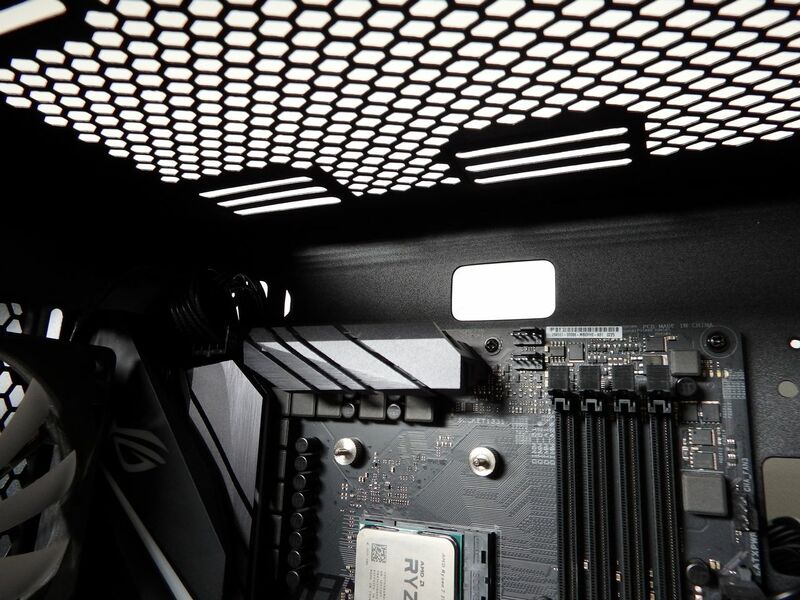 One of the key design elements is the dual chamber interior with a neat shroud providing a place to conceal the power supply along with any cables. 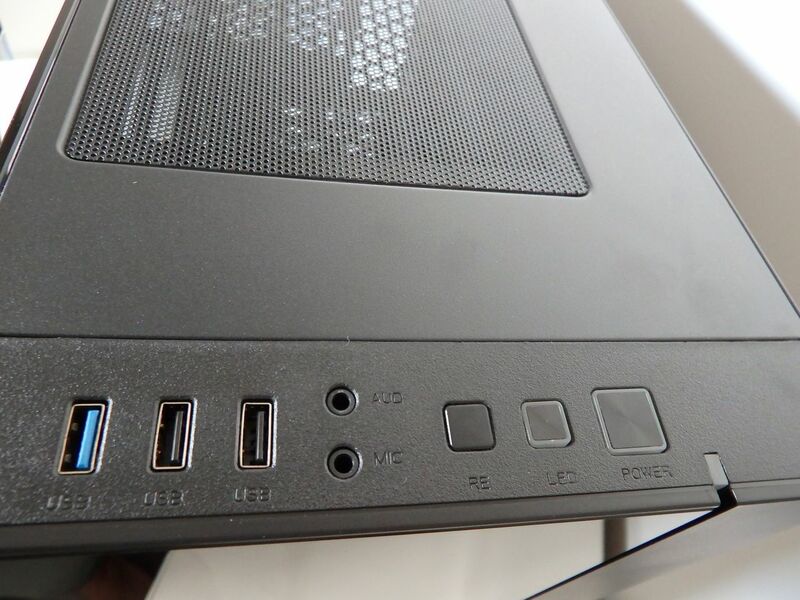 The front panel ports include 3.5mm audio (headset, microphone), power on/off, LED on/off, reset button, 2xUSB 2.0 and 1x USB 3.0. 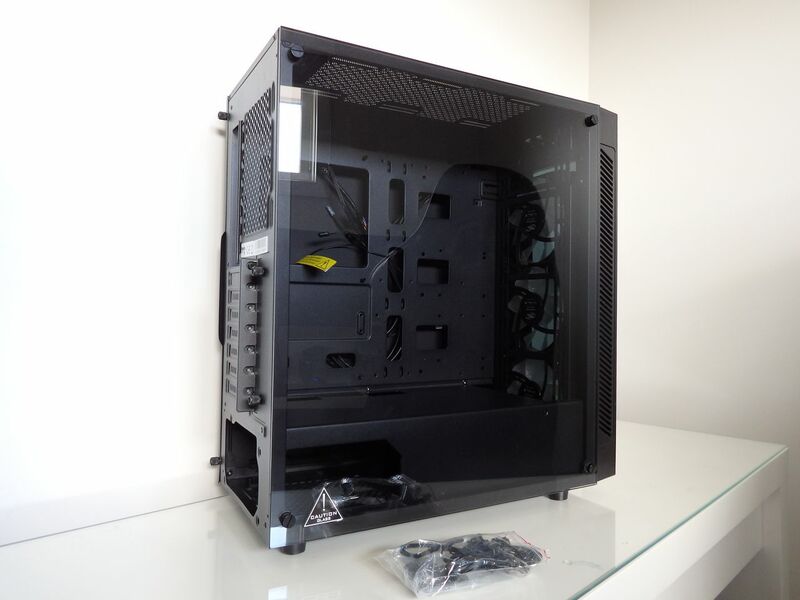 Overall I’d rate the manufacturing build quality as average and give it a pass. 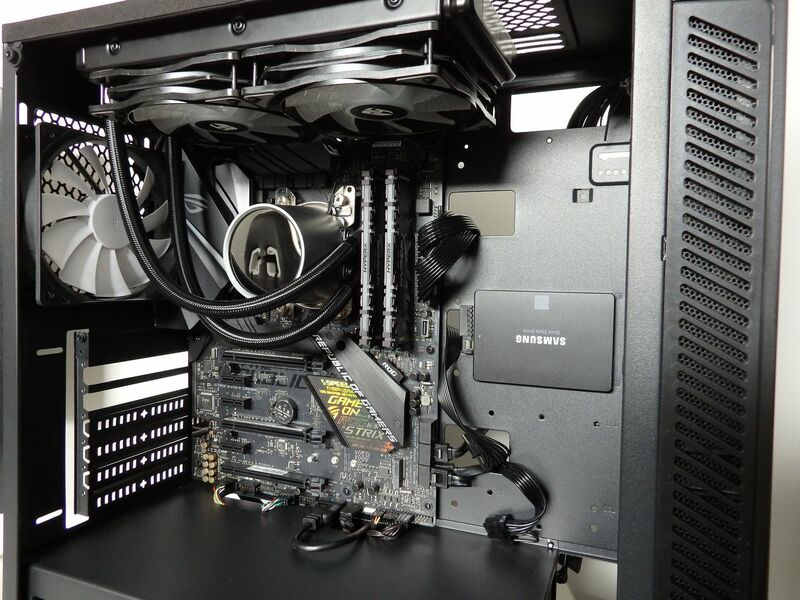 The powder coat is good, the cables of good length and everything fits together like it should. 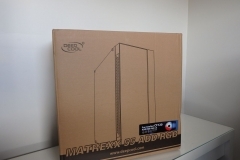 There is a clear difference in the grade of plastic and power used in the MATREXX 55 and something like the premium Quadstellar or what I’d typically expect in the mid-range. 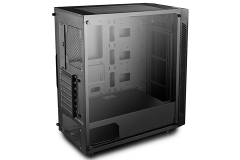 This isn’t a criticism as the grade of plastic used is appropriately matched with the price point – just something worth noting for build quality. 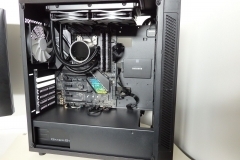 To keep things consistent we used the ASUS X470 STRIX test system for this one. 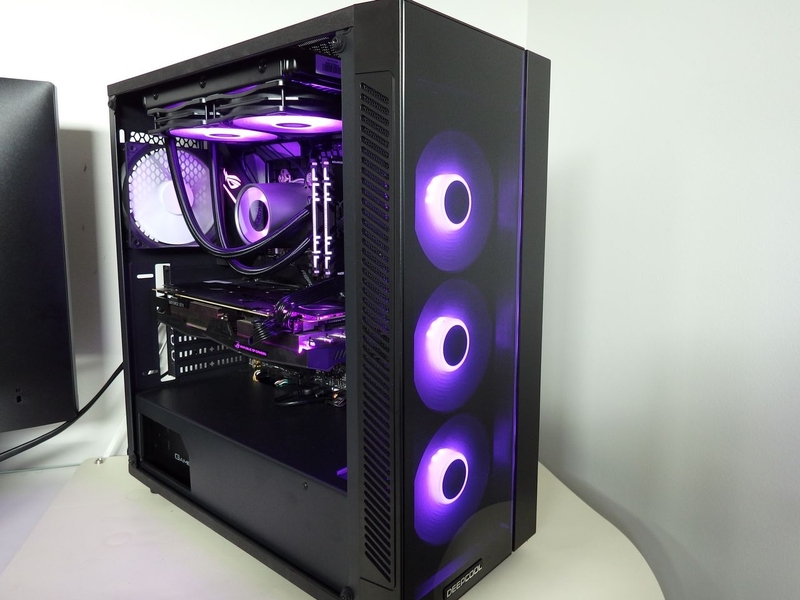 There were a few changes as we went with an ‘all-Deepcool’ build using the Castle 240RGB AIO cooler and a DQ 650-M power supply. 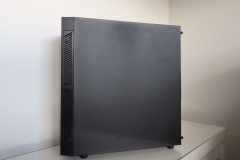 We saw a 6C difference in temperatures with the case being warmer if the side panel was on. This isn’t a bad result and your results may vary depending on the number, type and speed of additional fans you pair with this case. 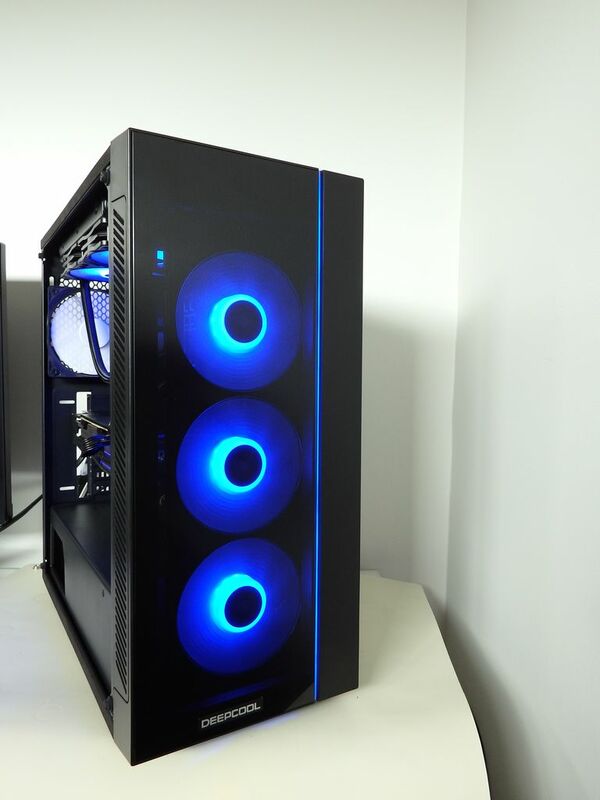 The inlet area at the front of the case is limited due to the clean finish with half glass design but despite the apparent restriction of side intake vents, the airflow is certainly adequate to cool an above average gaming rig with a high-end gaming CPU. 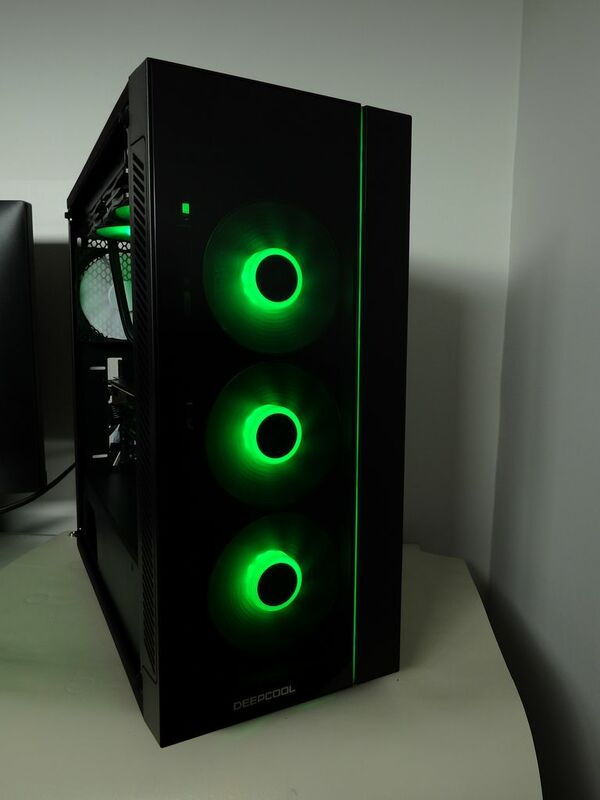 The LED fans and addressable lighting strip certainly make the case ‘pop’ and it looks more expensive than it is when built neatly. 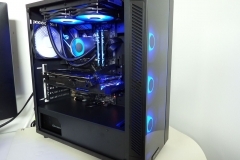 It’s a budget offering but does that mean ‘cheap’? 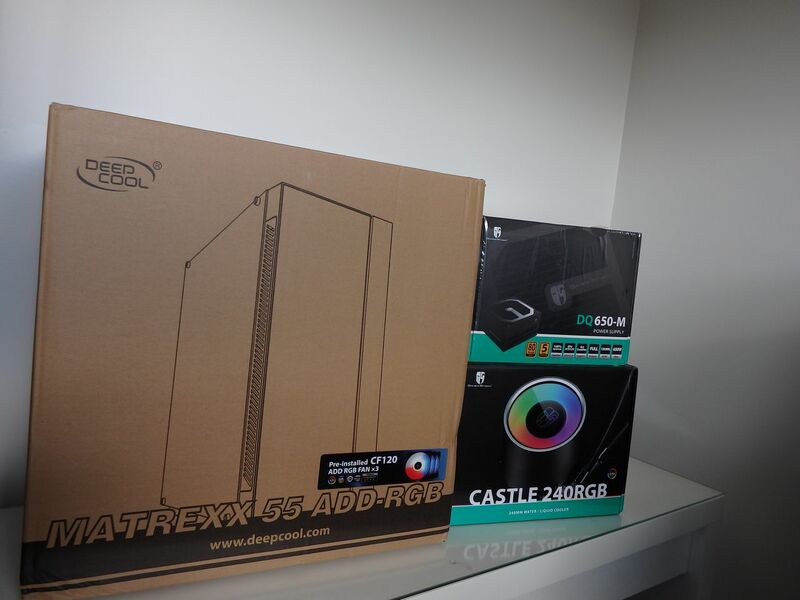 Kind of… When building in the case, there are several reminders that this is a budget case. 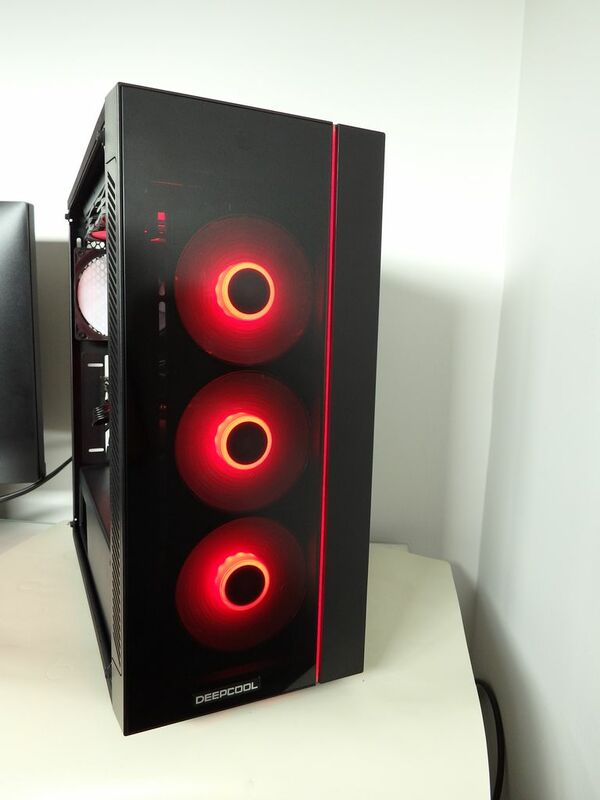 Three things struck me as ‘budget’ – lets get those out of the way first because the MATREXX 55 ADD-RGB has a lot going for it. 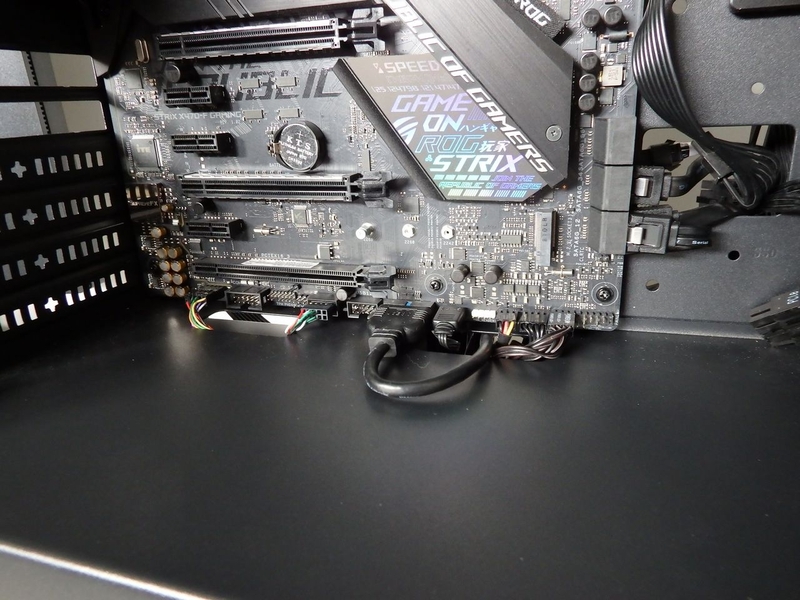 The rear PCIE slots have snap-out slot covers that you need to remove BEFORE you install the motherboard because you have to work them backwards and forwards to snap them out. 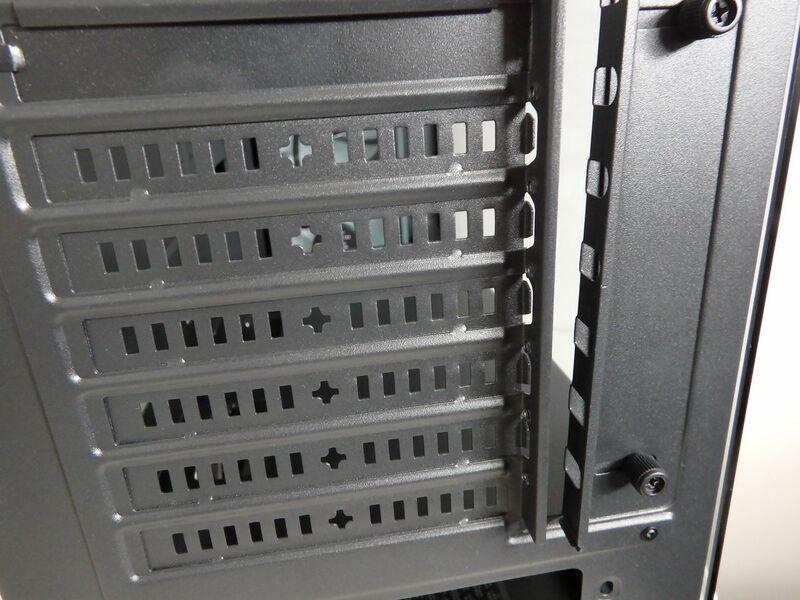 Most cases come with anti-vibration measures for the mechanical hard drives, rubber pads, tool-less trays etc. 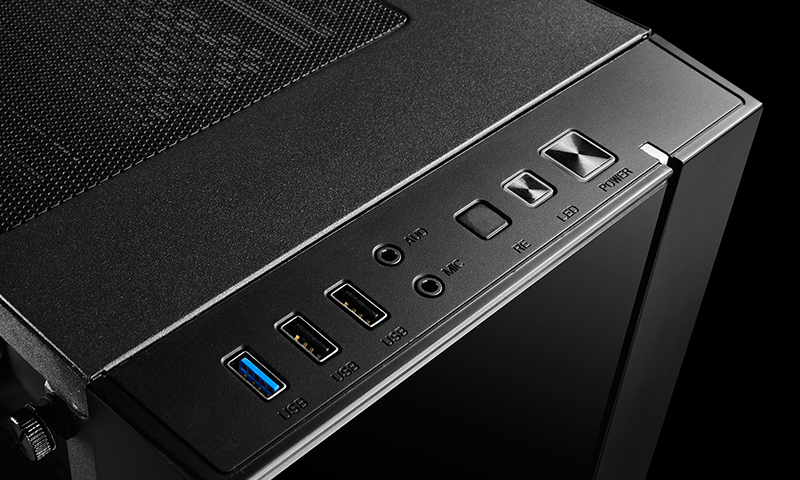 Not this one – you screw the hard drive into the tray and slide it into place before securing it with a thumb screw. 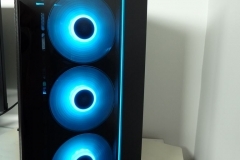 The design is effective and I didn’t notice any vibration or resonance coming from the case so whilst rubber hard drive anti-vibration elements weren’t included, the end result didn’t suffer at all. 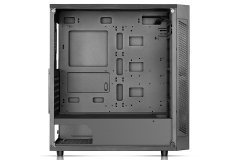 Then I looked at the design elements that make building in the MATREXX chassis really easy and it’s suddenly easy to forget that this case is a more ‘affordable’ option. 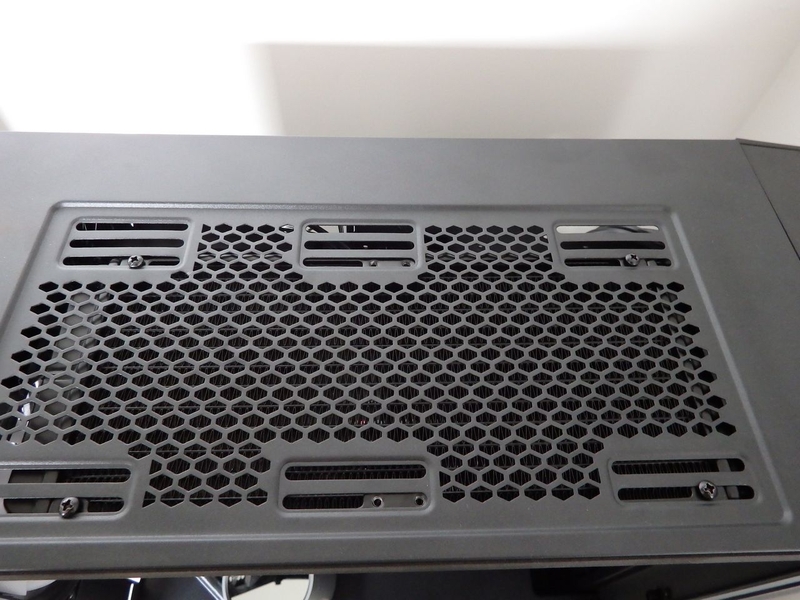 The space behind the motherboard tray is immense at 23mm with very few obstructions. 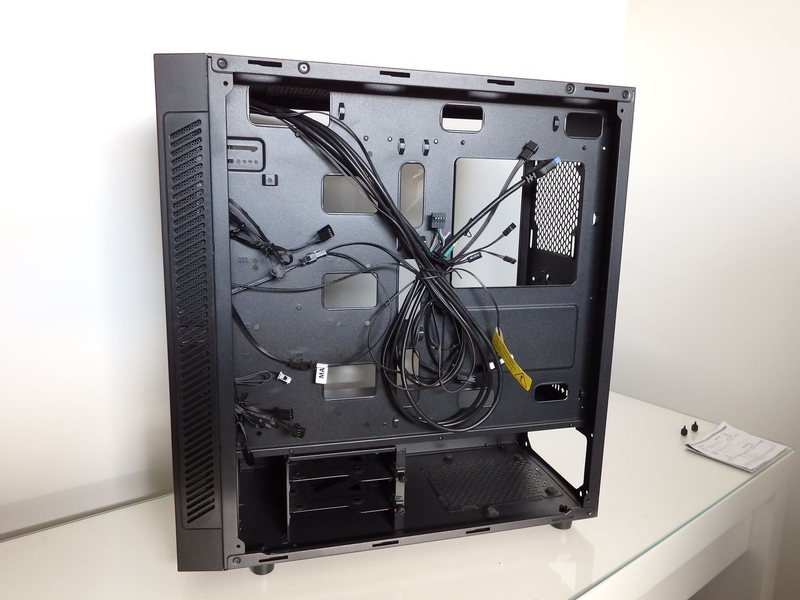 I was able to easily and neatly conceal a lot of LED, fan, SATA, power and front panel IO cables back here out of view. 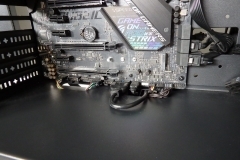 ZIP tie anchor points are in all the right places and there are a lot of them. 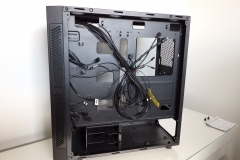 There are two spaces to conceal any excess cable ‘bundles’ you might have. 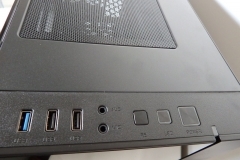 The design provides one space at the lower front of the case and there is another gap in the middle of the bottom chamber next to the power supply. 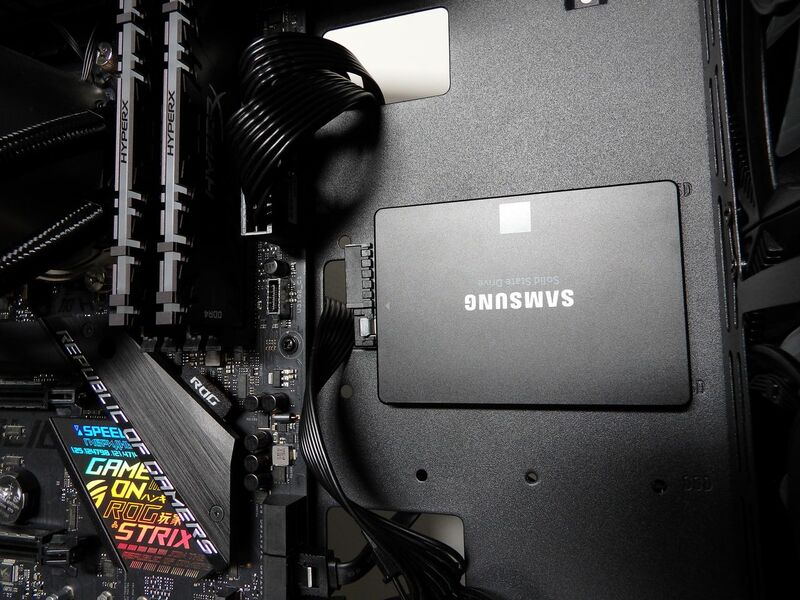 SSD and hard drive placement is also well thought out from a usability perspective in that they are easy to access and route cables neatly. 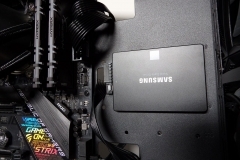 There is accommodation for the SATA power and data cables in both the SSD mounting area and the 3.5″ drive trays to make sure that your cables don’t get pinched or bent. 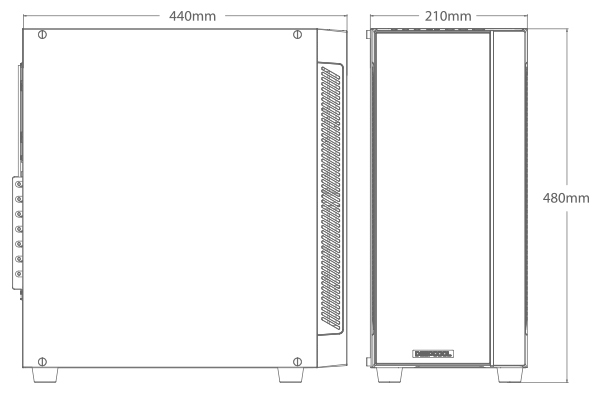 The 3.5″ drive trays go further into the case so as not to take up space in the 23mm clearance behind the side panel which keeps the hard drive connections clear of the main cable pathways. 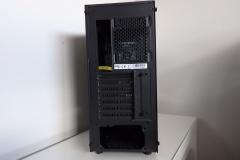 Power Supply / HDD chamber shroud to hide all the ‘hard to keep neat’ stuff. 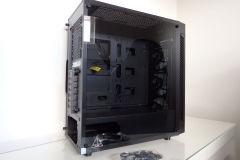 Even a novice /first time builder could make their rig look slick with this compartment. 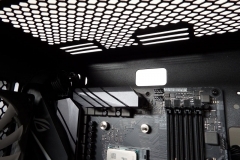 Fan mounts that are slotted to make for easy adjustment. 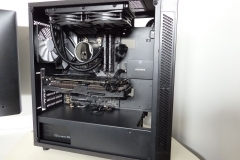 You can slide the rear fan up and down depending on the top radiator position to get it in just the right spot. 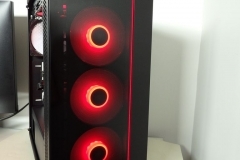 Adjusting the radiator at the top is also done in the same way but there are 2 sets of slots allowing for 240mm or 280mm radiators. 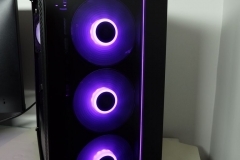 The way this has been implemented allows for better clearance if your radiator is thick and your RAM is tall. 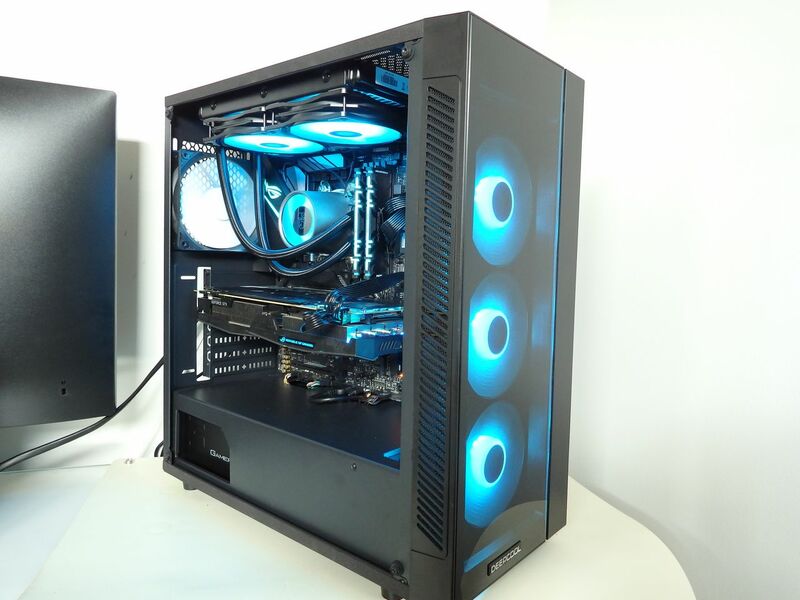 In our test setup, the Deepcool Castle RGB cooler easily cleared the tall HyperX Predator RGB DDR4 modules. 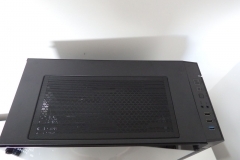 The top dust filer is magnetic and easily removable. 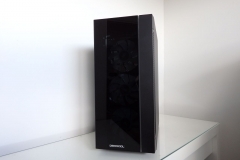 The fans are quiet and whilst not “Noctua Quiet” they certainly perform better acoustically than the price point suggests. 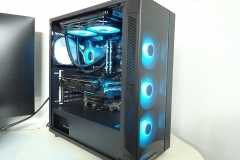 I don’t have any complaints about the airflow of the MATREXX 55 nor the practical build we assembled with the Deepcool Castle 240 RGB water cooler previously reviewed here. 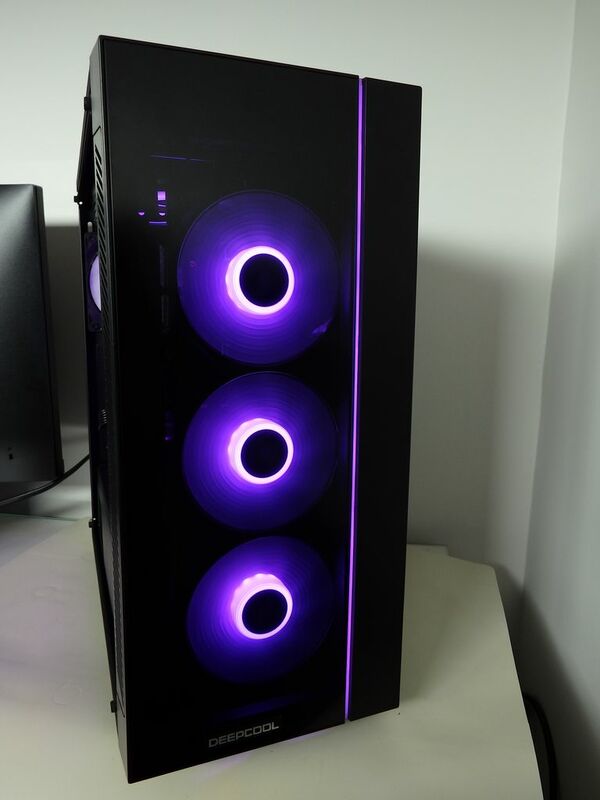 At $119 including the 3x120mm PWM RGB fans, addressable RGB light strip and a tempered glass side, the street price represents great value. 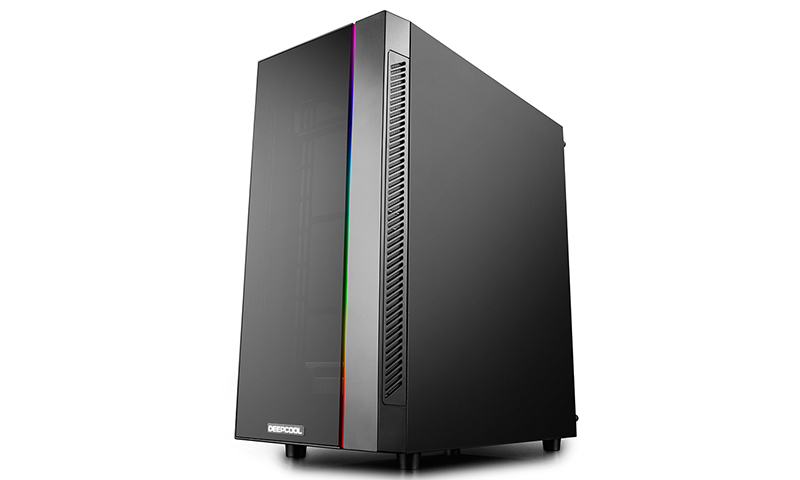 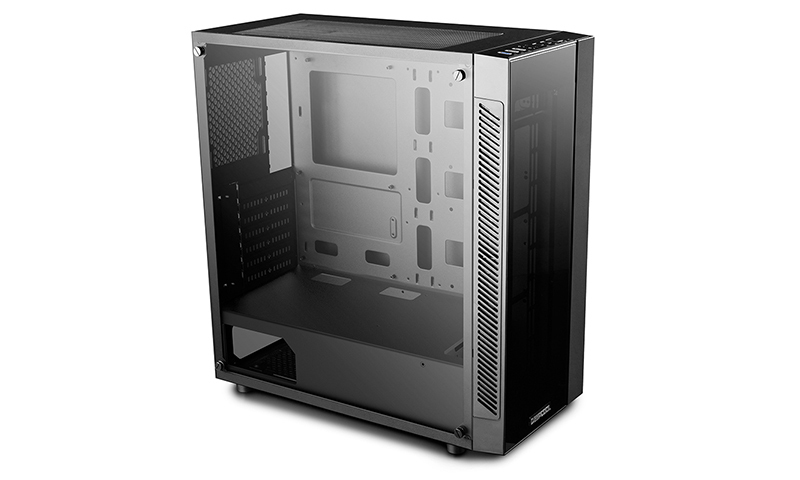 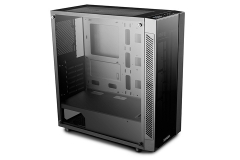 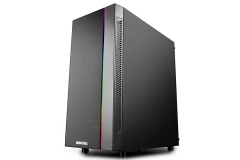 Buyers will still need to acquire at least one 120mm exhaust fan for the rear of the case. 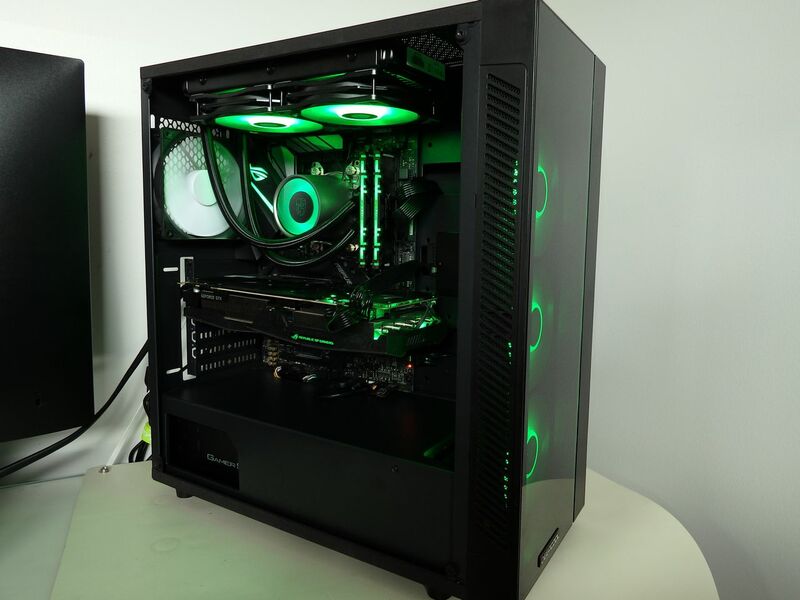 By fitting a 240mm radiator to the roof, the test build created a decent airflow that allowed the MATREXX 55 to perform to its potential. 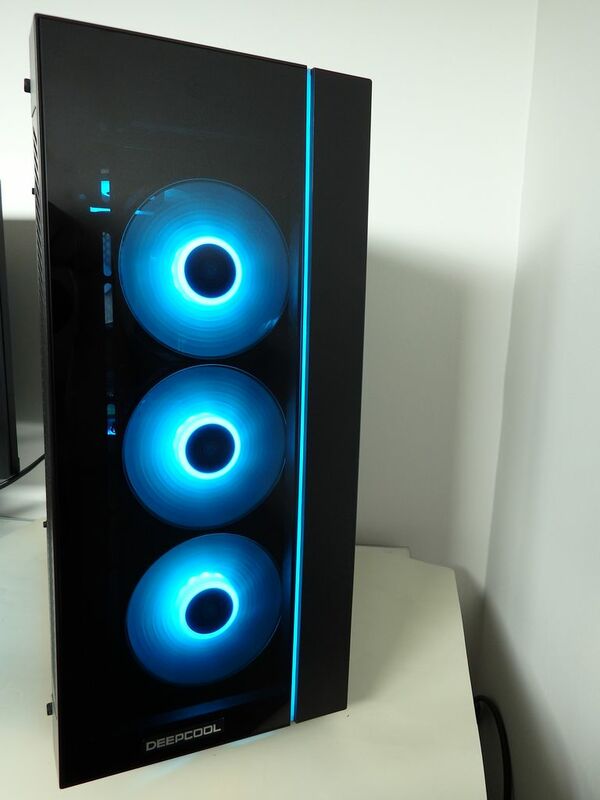 The competitive price also makes it easier to absorb the cost of a $140-$180 240mm AIO water cooler. 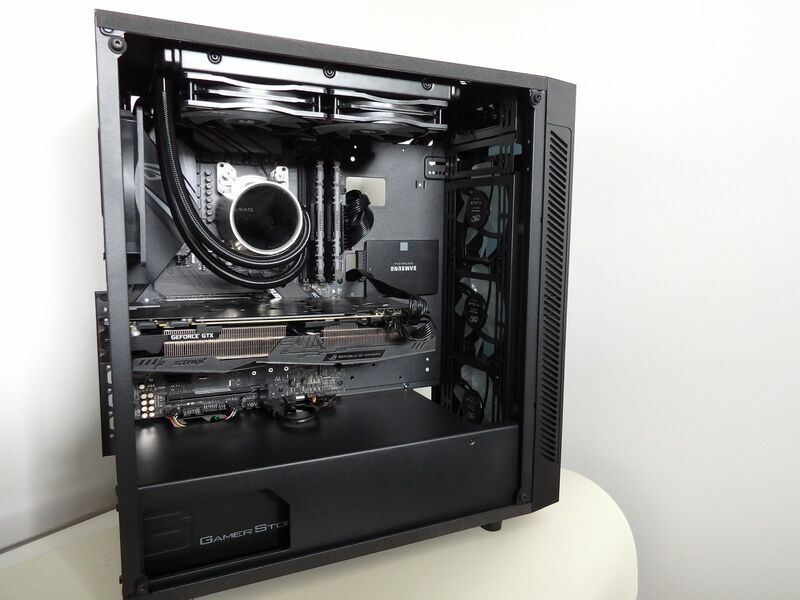 I appreciated the open main chamber design and the fact that the case, for the most part, is a very simple design that is quick to build in and easy to keep neat. 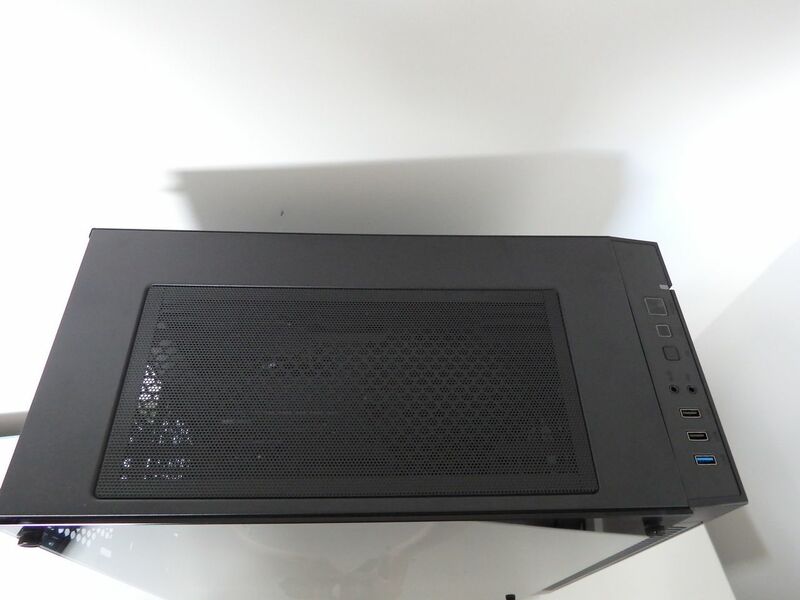 It will accommodate long graphics cards, the airflow seems to be fine despite the thin vents at the front edges and the tempered glass side panel gives the case a classy look. 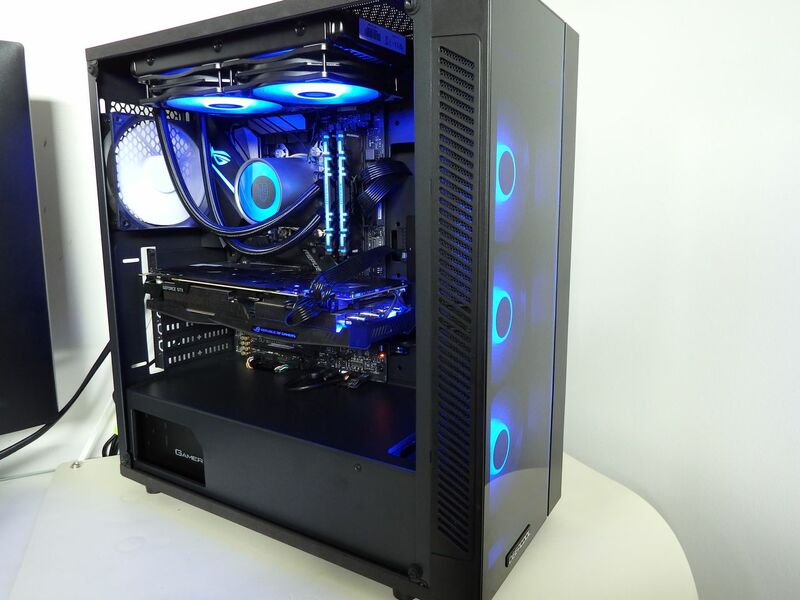 The finished product was almost ‘all-Deepcool’ and it came up well in conjunction with our high-end Ryzen 7 2700X ASUS STRIX test system. 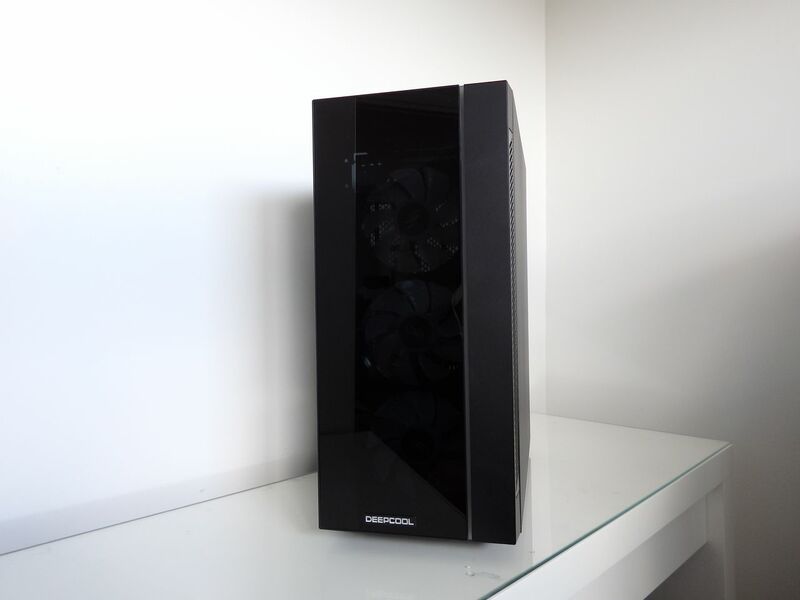 The performance was solid, the heat and noise remained under control and the whole system looked great while gaming. 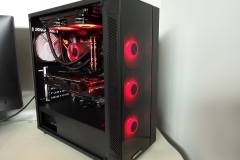 When facing budget pressure, one of the first compromises I’ll make is the case because the components deliver the performance. 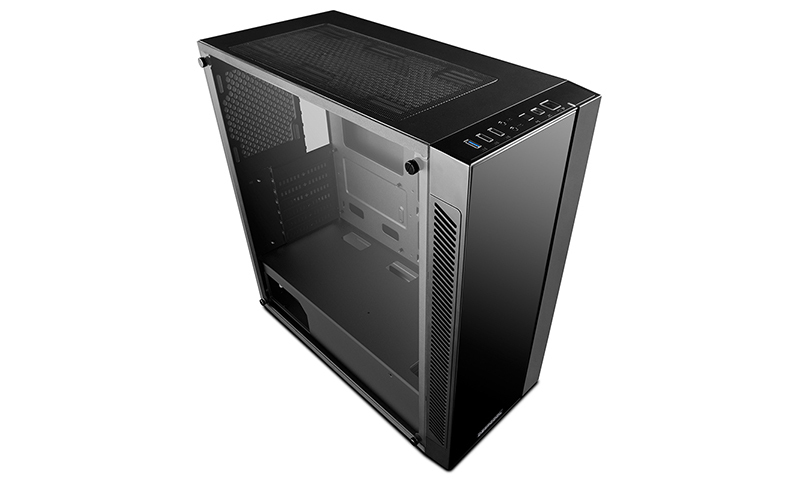 The main thing is that whatever case I use shouldn’t suffocate (or cook) my components and the MATREXX 55 chassis is fine in this regard. 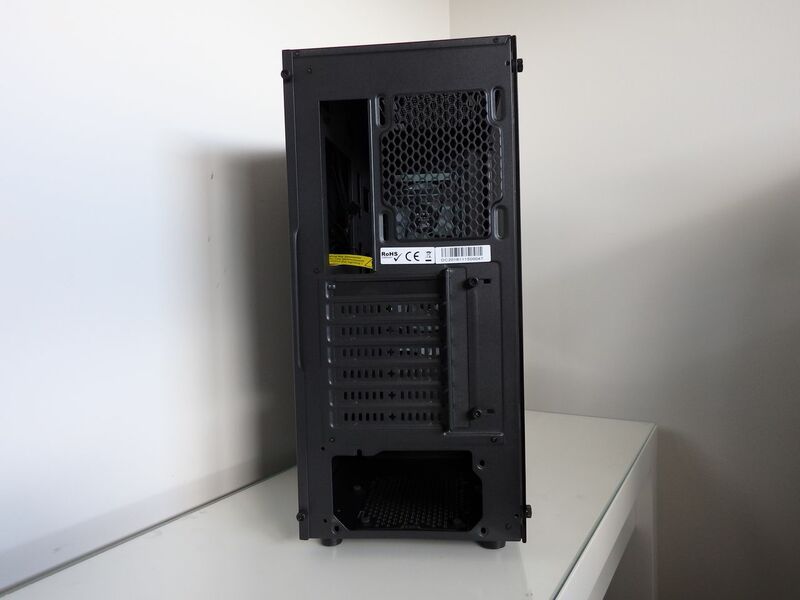 If funds are tight, my advice is always to buy the cheapest case that your ego can afford – this one is a good balance and should satisfy most egos. 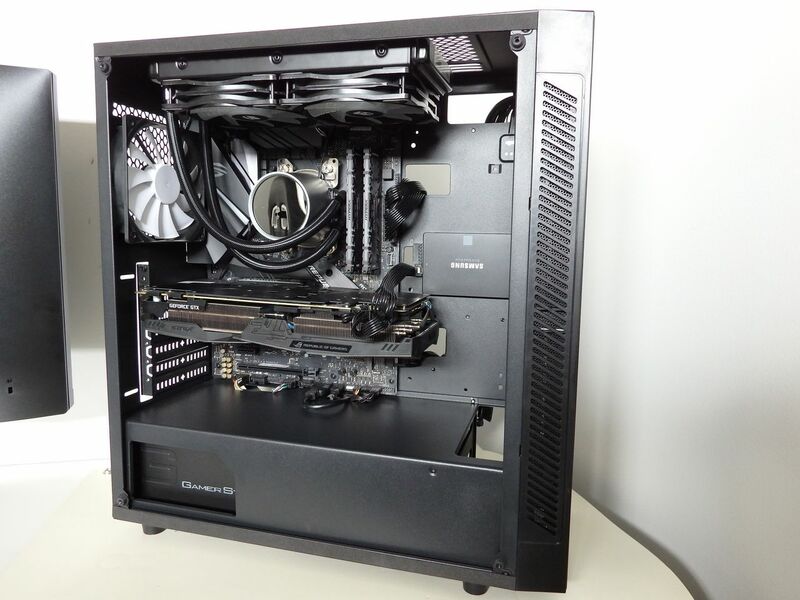 The MATREXX 55 chassis also looks pretty ‘moddable’ so you could relatively easily make it your own either immediately or later on once you need a change. 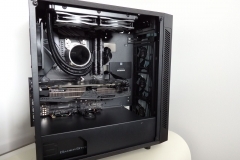 There were some areas that I noticed when building in the case that I felt cheapened it a bit such as the lack of grommets, the snap-out PCIE slot covers and lack of anti-vibration measures. 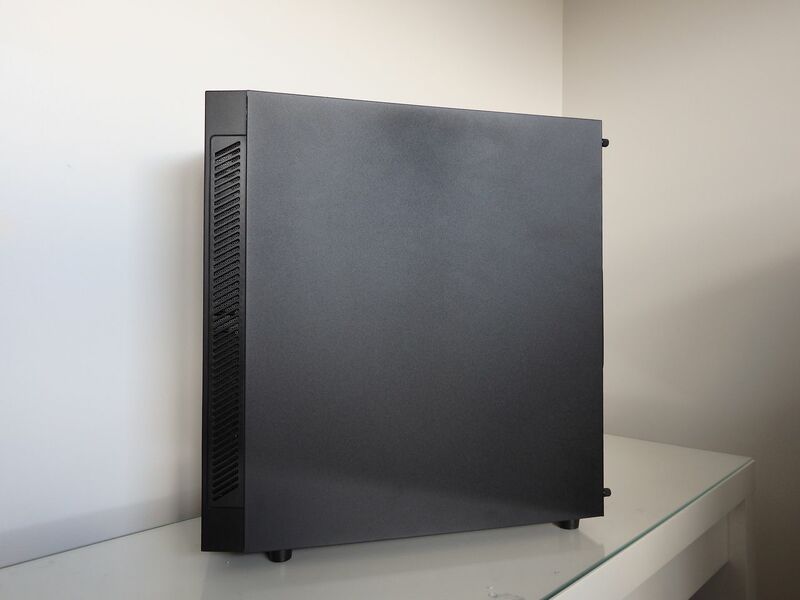 I felt that the thoughtful design, inherent flexibility, ease of building and quality of the powder coat more than made up for the obvious cost cutting in manufacturing. 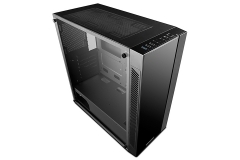 The price is competitive and I’d have no hesitation in recommending this case for budget to mid-range systems. 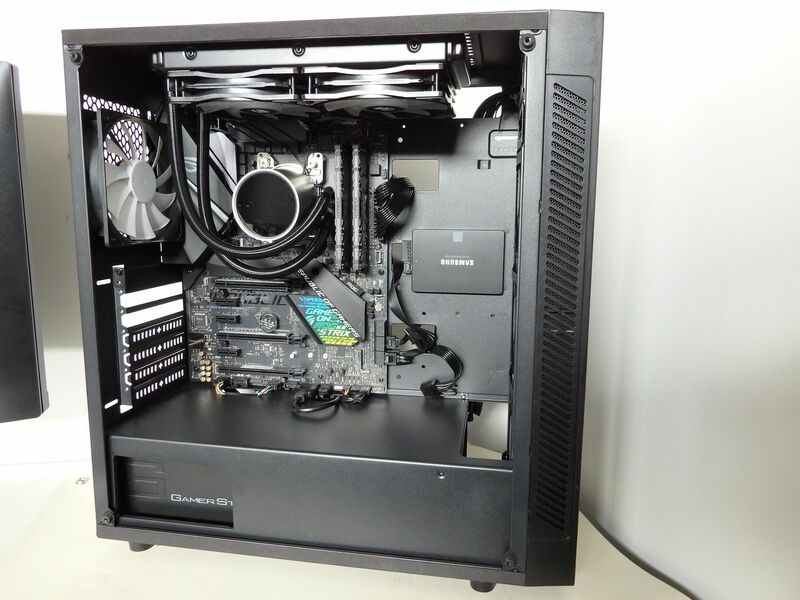 It’s very forgiving if you’re a first time PC builder while providing easy access to upgrade components as needed. 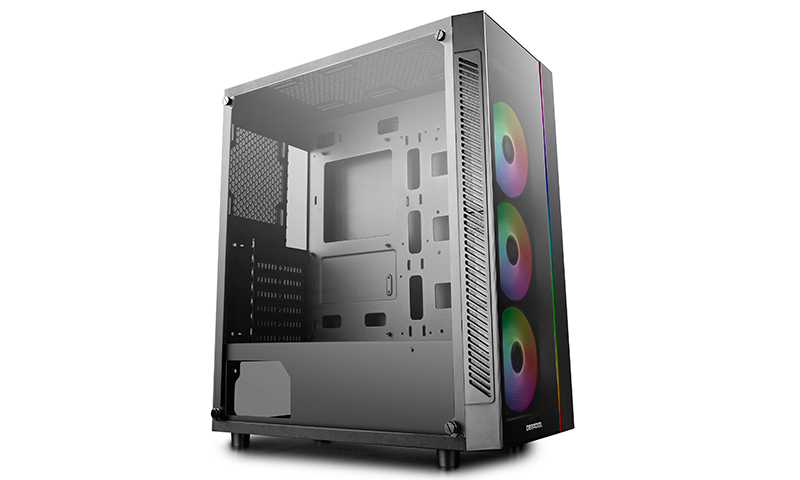 On a personal note, I’d love to see a white (white plastic/powder coat instead of black) version of this case, retaining the black mesh and tinted tempered glass panels for contrast. 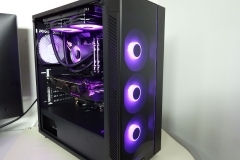 The MATREXX 55 ADD-RGB 3F is a solid revision of the base MATREXX 55 chassis and worth a look for those wanting something practical, attractive and affordable. 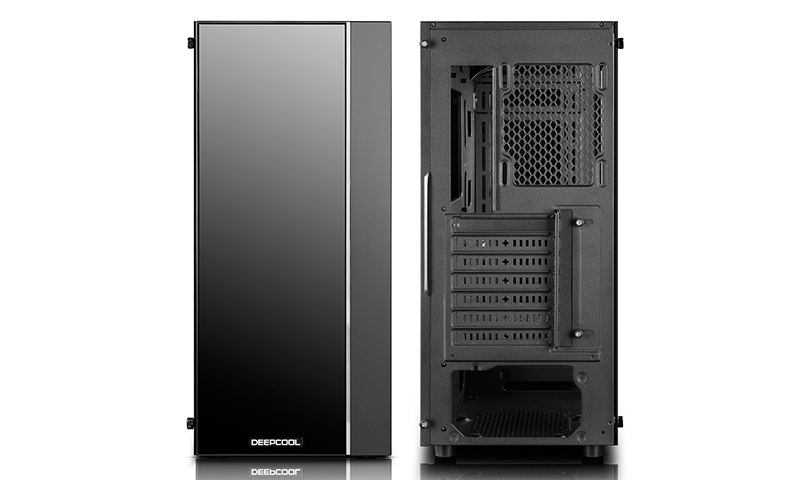 i plan to overclock so airflow/temps are important but the deepcool definitely looks better. 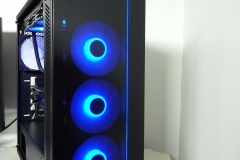 The Fractal case looks to have a better and unobstructed airflow intake so it should run cooler with less RPM required on the fans ‘feeding’ the system. 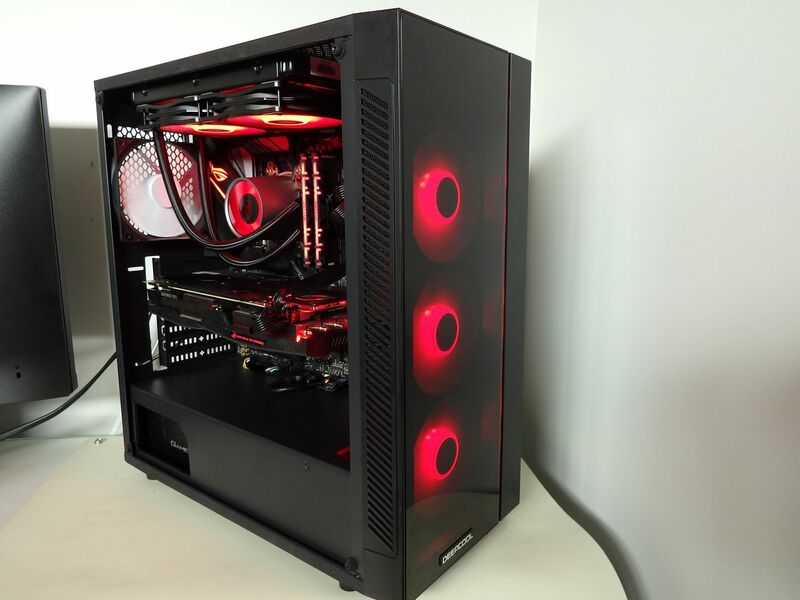 That said, I really like the Matrexx55 as a chassis aesthetically and the temps with our AIO cooled 2700X CPU were fine for gaming and typical workloads. 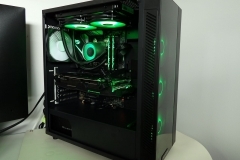 Your graphics card selection will also impact on the case temperatures as well. 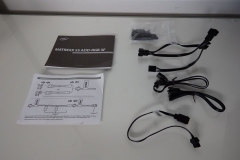 What are the other components you plan to use?